Create the perfect ambiance inside and out by hiring these stunning Bay trees. Fitted with white lights and an organza sash at no extra cost in a colour scheme to match your event. 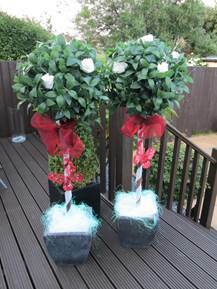 Take a look at our Organza Swags, Bunting and Aisle runners/Table flowers to complete your look.